Walk down the Calle Real, past the church and through fields for about 2 kilometres when you will then reach another small village called Camponaraya. Here you will find a hostal if you wish to stay the night, some bars, shops and a bank and the Ermita Nuestra Señora de la Soledad. As you walk through the village you get the feeling that it's never going to end as it is a long narrow village. After passing the church cross the bridge over the Rio Naraya and soon you will come across a track through some vines that belong to the Co-operativa Viñas del Bierzo. If you fancy some wine the company sells it by the glass. Thankfully we have escaped the ugliness of the exit to Ponferrada and for a little while at least we will be walking through vineyards and orchards. When you come to the motorway take the bridge over it and turn left through some more vines for about 1.5 kilometres, when you will cross the road towards Cacabelos. Cacabelos as a village first appeared in the 10th century but it can trace its origins to way back in the Bronze Age. Prior to becoming the village of Cacabelos it had previously been known as Ventosa but this village had more or less disappeared before the 10th century when the lands were given to the Monasterio de Carracedo by Bermudo II the King of Galicia and León. The village wasn't actually rebuilt until the early 12th century when the Archbishop of Santiago, Diego Gelmírez came along and built the Iglesia de Santa Maria. Unfortunately, he caused a bit of a quarrel with the Bishop of Astorga under whose jurisdiction the village came under. The argument was finally resolved when Alfonso VII, the king of Galicia and of Castilla y Leon gave the town to the Archbishop of Santiago. 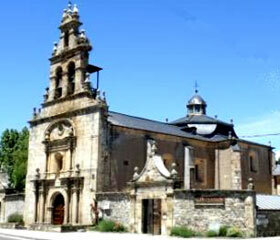 At the height of the Camino's popularity in the Middle Ages the town boasted 4 churches and 5 pilgrim hospitals. Nothing remains of these ancient buildings but the 18th century Santuario de la Quinta Angustia, where you will find an unusual carving of the child Jesus playing cards with San Antonio de Padua, has been built on the site of one of the medieval hospitals. This is also where you will find the albergue at the side. There are a couple of museums in the village, one dedicated to the archaeological findings of the region and the other to the wine industry of El Bierzo. In 1809, during the Peninsula war, General Sir John Moore's men were trying to retreat across the mountains to get to back their navy which was based in La Coruña when they reached Cacabelos. The French army was forcing them into retreat and as Moore's men reached the bridge in Cacabelos one of the General's marksmen, Thomas Plunkett, decided to take a pot shot at the commander of the French army. Thankfully he was an excellent shot and he hit the French commander right through the head. This single act saved the British army from being overrun by the French army and thus allowing a more civilised retreat into Galicia. Other than the Albergue next to the Santuario de la Quinta Angustia there are also 3 hostals to stay in. As it is a reasonably large village there are a number of shops, banks, restaurants etc. Walk out of Cacabelos down the main street passing the Capilla de San Roque and down the Calle de las Angustias. Cross the bridge over the river and walk down the main road for about 2 kilometres until you get to the small hamlet of Pierros. Follow the road marked Camino Viejo down a track which will take you through the vineyards and past the Iglesia de Santiago and its cemetery on the outskirts of Villafranca del Bierzo. 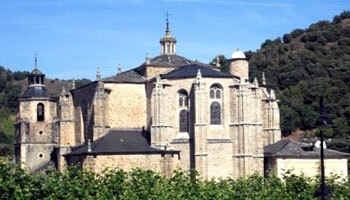 Villafranca del Bierzo is believed to have been founded by French monks of the Cluny order. They built a monastery here called el Monasterio de Santa Maria de Cluniaco during the years following the discovery of Santiago's body in 813 in order to service the needs of the many pilgrims who passed this way. As the monks were French the village became known as Villafranca or town of the French. 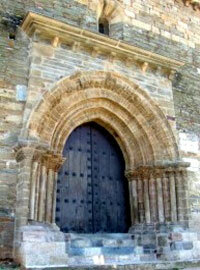 In terms of pilgrim architecture Villafranca del Bierzo once had as many as 8 monasteries and 6 pilgrim hospitals. This is the last major town along the Camino de Santiago in Leon with the Galician village of O Cebreiro only 30 kilometres away. The town could be said to owe its existence to the Camino and both this and the many monuments to be found here make Villafranca del Bierzo a natural tourist destination. There is plenty to see but below are some that may be of particular interest. 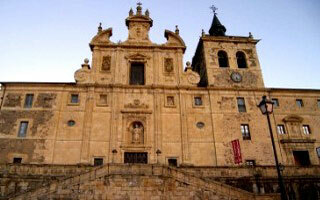 Just as you enter the town you come across the 12th century Iglesia de Santiago. This church was granted the privilege of providing absolution to the pilgrims who were too ill to continue along the Camino to Santiago. This absolution was received at the Puerta del Perdón, the door of forgiveness which can be found at the side of the church. 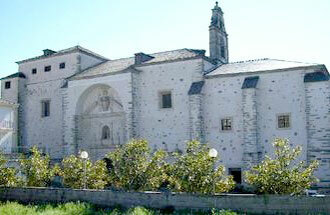 Another building is the Convento de la Anuciada. 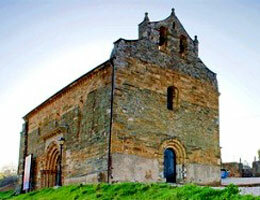 The church was founded in the early 17th century by Don Pedro Alvarez de Toledo y Osorio, one of the Marqueses of Villafranca, for his daughter who had chosen to become a nun. The church is built on the remains of one of the many pilgrim hospitals that had sprung up in the town. Inside are the remains of San Lorenzo de Brindis brought back from Lisbon, where the saint died, by the Marqués. Also inside can be found the Panteon de los Marqueses the crypt for the family who still inhabit the castle. The impressive building of San Nicolás was founded by Don Gabriel de Robles in the 17th century as a religious school run by Jesuits until their expulsion in 1767. During the early 19th century the building became the centre for local government until it was sold by Roble's heirs in 1899 to the Padres Paúles who converted it back into a school which was still in use until 1983. Now it is a museum of natural sciences. The beautiful building of La Colegiata de Santa Maria was built on the site of the original monastery in Villafranca by the 2nd Marqués de Villafranca, Pedro de Toledo in the 16th century. Inside you will find a number of lovely paintings and sculptures and outside the peaceful gardens encourage you to sit and while away a minute or two. The Calle del Agua has some interesting houses with many of them emblazoned with the crests of the noble families who once owned them. Of particular interest is the Palacio de los Marqueses de Villafranca and the Palacio de Torquemada. Continued on Stage 26 - page 3.